Palyul Monastery was built by the great Dharma king of Dege on holy land that had been blessed by many saints and bodhisattvas. The great treasure revealer Migyur Dorje (1645-1667) instructed the Dharma king of Dege, and he instructed Vidyadhara (knowledge holder) Kunzang Sherab (1636-1699) to oversee the monastery. Kunzang Sherab became the first throne holder of the Palyul Lineage. 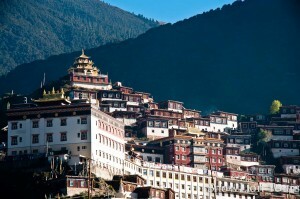 He named the monastery Palyul Namgyal Jangchub Choeling, “The Dharma Land of Victorious Perfect Enlightenment” and caused the Palyul Monastery to become a great source of the Buddha’s teaching. As with all Nyingma Dharma lineages, the Palyul holds the complete canon of the Mahayana sutras and tantras as well as the Kama (long), Terma (short) and Pure Vision transmissions. All the throne and lineage holders of the Palyul tradition were well known as great scholars of Sutra, Tantra and the outer and inner sciences. Presently, H.H. Karma Kuchen Rinpoche is the 12th Thronholder of the Palyul Lineage.